The Black Act: Witch Twins Companion is now available for free at Kobo and Smashwords, and for 99 cents at BN and Amazon. It should go free at BN soon, and I’ll post an update when it does. Many thanks going out to Kate Jonez again for being a part of this. Here’s the full table of contents below, along with buy and download links. In the next few days, I’ll add a pdf download direct from this site, also. 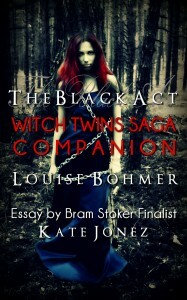 About: The Black Act: Witch Twins Saga Companion is a guide to the world found in the dark fantasy novel by Louise Bohmer. This ebook includes an essay by Bram Stoker nominated author Kate Jonez, a glossary of terms, a play list, excerpt from The Black Act: Witch Twins Saga, and more. And you can pick up the novel at online retailers for only $2.99. 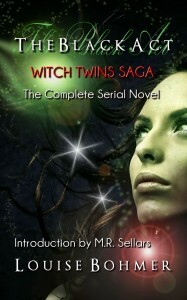 Introduction by award winning paranormal thriller author M.R. Sellars included. The covers are absolutely stunning!